I’m not really sure what to say about this page. Wait, that thing's a FAERIE? YES! CALLED IT! ….I impress myself easily, don't mind me. Oh, THAT'S why he's wearing the slave cuff things still. Also, WHAT THE HELL IS A FAERIE!? Now I feel the need to visit the "Rouge Angles of Satin" Tropes page. …And that's how Rei became an obsessive collector of iron pans. "Rei, stop hitting that puddle on the sidewalk." "Rei!" "No, it's a faerie spy!" And then Demopan joins in. I laugh at how people are asking about the faerie. They haven't read enough real faerie tales. 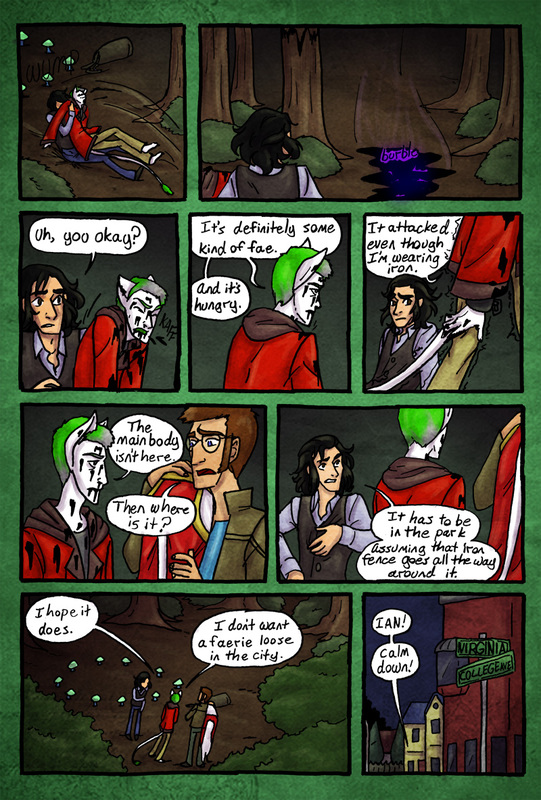 Also, Gabry's face in the 5th panel…it just connects back to Sin Pararse…He looks sad or guilty for me. so that's what those cuffs he has are, iron shackles. i guess he wanted to keep them to keep fae away. Rei's eyebrows can't decide whether they want to be green or grey. Haha, no, sorry. It’s set in a fictional city that’s loosely based on Danville, VA and a few locations from other cities in Virginia and North Carolina. How is Gabry touching Rei?? He’s not. He’s touching Rei’s clothes.